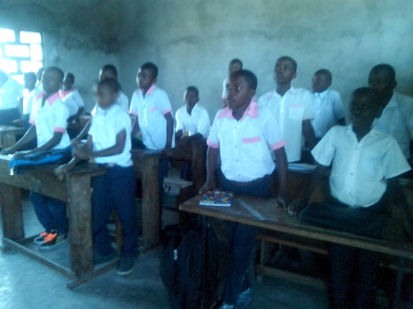 On September 23rd, Project Manager Dr. Jerry Kindomba visited the classrooms at College des Saviors in order to promote continued good performance for this school year. While visiting the seventh grade, Dr. Jerry showed the students two videos pertaining to sustainability, and praised the flexibility and confidence of the students under the sustainability curriculum. 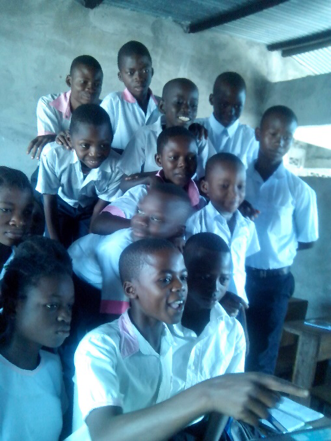 Dr. Jerry then rewarded the students by showing them a video of him swimming for the first time in his life, having overcome a life-long fear of swimming. 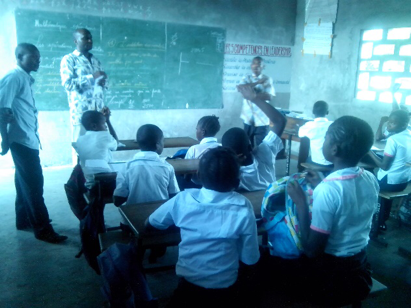 In regards to the classroom visits, Dr. Jerry said that he found an overall sense of enthusiasm and a positive environment from both the students and teachers. In addition to starting the school year off with classroom visits, we are excited to announce that we have a new addition to the College des Saviors staff this year. Student Beya Beya’s mother has been hired by the school after the school found out about the families’ difficulty in making ends meet. Gracia’s comment exemplifies the fact that GBA strives to be inclusive and community-oriented, working over the years to bring students, families, and community members together.